RebelLabs survey results are in. Despite having multiple aggressive competitors, Java EE is still wildly adopted among developers and is the golden standard. The RebelLabs Developer Productivity survey is one of the most important ones in the Java ecosystem. It is widely circulated and generally tends to have the most data points. 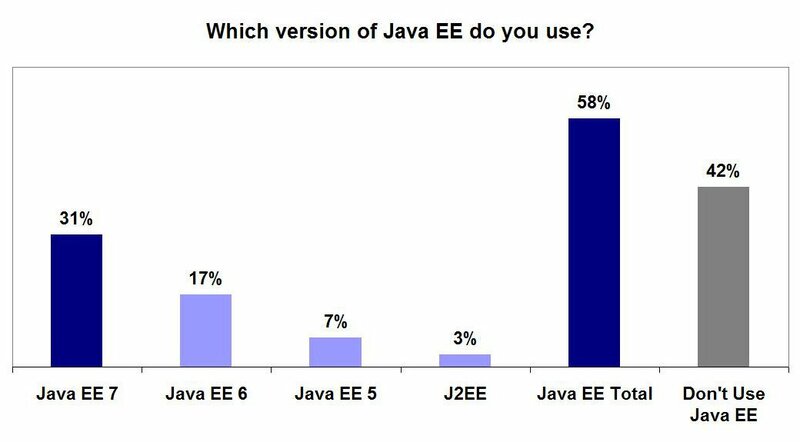 The survey has always asked about Java EE as well as Java SE adoption. The results of the 2016 survey look encouraging for Java EE generally and Java EE 7 specifically, particularly given the seemingly perpetual nay-saying around Java and Java EE in predictable corners of our ever "colorful" industry. The RebelLabs survey is a bit different from the similar DZone survey in that it asks participants to make mutually exclusive adoption choices. You can either be a Java EE user or a Java SE user. You are only allowed to choose one specific version of Java EE. While this may not be entirely reflective of more complex scenarios in real life, it does make the results a bit more interesting from an analytical perspective. The 2016 results for Java EE adoption are shown in the graphic below. A clear majority of developers — 58% — identified themselves as Java EE users. This is truly remarkable for a mature open standard like Java EE with a number of non-standard product vendors aggressively positioning themselves as competitors to Java EE for many years now. Even more encouragingly developers seem to be solidly behind Java EE 7 — far more so than previous versions including Java EE 6. It is especially good to see the number of J2EE users at a low percentage. While all of this is good news, the Java EE community can ill afford to rest on its laurels even for a moment. A number of us in the Java EE Guardian community were very worried what the RebelLabs survey was going to show in 2016. This is because the survey was taken when Oracle's commitment behind Java EE 8 still remained very uncertain. In fact, RebelLabs correctly noted this may be a reason for lower participant support for Java EE compared to other years and the Java EE community has hard work ahead of it. This is wise advice for the Java EE community and a reason to continue to try our best to advance Java EE. All that being said, it is important to remember that none of these are scientific surveys in any real sense so it is always a good idea to only make high-level observations around them. Scientific surveys are truly random, have representative sample sets and clearly identify participants. Most of the surveys we have are unfortunately always self-selection based and at least partially anonymous/online. On behalf of the Java EE Guardian community, it is only correct to thank everyone that indicate their support for Java EE and Java EE 7 in such surveys. Our volunteer-driven work is intended to benefit you first and foremost — it is good to see that intent does not get lost in the muddle.